Slapstick 2007 - Slapstick | Bristol's Silent Comedy Festival. Bristol’s Silent Comedy Festival returns for a third year. 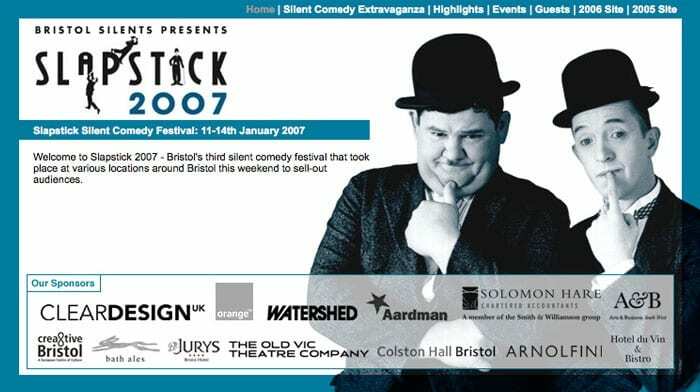 Slapstick 2007 is bigger and even funnier than before, with events held across three Bristol venues: Watershed, Arnolfini and Colston Hall. Hosted once more by Paul Merton, it features a wealth of special guests including Bonzo front man and ex-Rutle Neil Innes , Graeme Garden , Aardman Animation’s Peter Lord , Triple Oscar winner Richard Williams , pianist and composer Neil Brand and film historian David Robinson . A joyous celebration of the best silent comedy on the planet. All individual events cost £6 or £4 concessions/ Bristol Silents members unless otherwise stated.